At least 12 infants were fed formula milk from a batch potentially contaminated with bacteria while they were in hospital earlier this month, but so far, all are well. The 12 were patients at KK Women's and Children's Hospital (KKH), while a baby at National University Hospital (NUH) may have been given milk from the recalled batch of Dumex's Stage 1 Mamil Gold Infant Milk Formula, the hospitals said in an update yesterday. On Tuesday, the Health Ministry disclosed that formula from the implicated batch had been used at the two hospitals between Aug 1 and 20. The 4,200 tins, which were imported from Malaysia, had been on sale islandwide since January. They were recalled after samples tested positive for Cronobacter sakazakii bacteria, the Agri-Food and Veterinary Authority (AVA) had said on Monday. While rare, infections from the bacterium can be fatal to newborn babies. Symptoms include fever, poor feeding and lethargy. No cases have been reported so far. Associate Professor Ng Kee Chong, chairman of the KKH medical board, said out of the 13 caregivers whose children were suspected to have been given the infant formula, 12 have confirmed it and all are reported to be well. 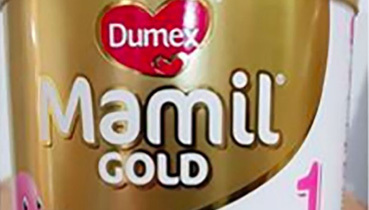 The hospital has also stopped the use of the Dumex Mamil Gold brand of milk powder. "Our top priority is the health of the babies," Prof Ng said, adding that caregivers should consult a doctor immediately if their infant shows the specified symptoms or feels unwell. An NUH spokesman said it has reviewed its records and one patient may have been fed the product. The infant's caregiver has been advised to monitor his child's condition and seek treatment if symptoms develop. Worried parents, meanwhile, flooded Dumex's phone line and Facebook page, with some raising concerns over product refund forms that they said they were asked to sign that waive their rights to any future claims. Civil servant Tan Eng Yi, who bought a tin from the affected batch for his five-month-old son, showed The Straits Times a copy of the refund form. The form, which lists the batch number and retail price of $54.50, asks for a name, identification number and signature, and says a cheque refund will be given to the claimant in two weeks. It states that in consideration of the exchange/refund received, the consumer agrees to release Danone Dumex Early Life Nutrition Singapore and KWH Marketing from "all rights or claims that (the consumer) may have arising from, relating to and/or in connection with the Dumex products". Dumex told The Straits Times that the purpose of the clause is to "avoid double exchanges and double refunds", adding that it has reviewed and amended the sentence to avoid any confusion. It did not say what the amended version is. Mr Tan, who is in his 40s, refused to sign the form. He said: "My main concern is about Dumex's ethics... What about those parents who have already sent in their forms - will they receive new ones?" Lawyer Eugene Thuraisingam said consumers are within their rights to seek a refund from Dumex without having to sign a waiver. "Under the law, if a product is defective, there is an obligation on Dumex to refund the money paid." If the form serves as a waiver of further rights, it is "clearly meant to circumvent further proceedings... The difficulty will arise if there is actual damage suffered that will only surface later," he added. Mr Loy York Jiun, executive director of the Consumers Association of Singapore, said: "It is unfair to ask consumers to give up their right to seek further claims for potential losses, for example, arising from any illness to their child, when consumers are receiving a refund of the monies paid for the milk powder only." Such clauses "may give the false impression that consumers have to waive all their rights on the matter to obtain a refund on a product that they have been advised not to consume", he added.